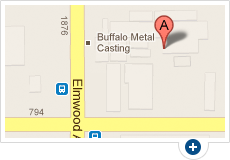 Buffalo Metal Casting is a reliable single-source supplier of non-ferrous castings and finished parts serving locations nationwide. All steps of the casting process, from pattern making to precision machining and assembly, are performed in-house under our supervision and control, providing you with the quality assurance you expect and the peace of mind you deserve. Our extensive capabilities - from prototype casting to high volume runs - enable us to handle virtually any job on your behalf, regardless of size. Our metal casting company is capable of both machining services and sand casting services. We pride ourselves on our wide variety of equipment and ability to do any job efficiently and at a cost-effective price. We offer permanent mold casting, green sand casting services, no-bake sand casting, CNC machining, milling, and much more. For a complete list of our services visit our Products & Services page. Whether you need sand casting services, CNC machining, or any other of our services to create your part, we're the metal casting company that's right for the job. For a free and easy quote on your next project, call us at 716-874-6211 or visit our contact page.